Well Hello! Don't be surprised with another Korean skin care blog. Skin care's been my main focus lately so expect more updates in the future, of course. I received some more great skincare samples from a recently opened online shop which has a lot of great Korean brands to offer. I had a lovely chat with *The Skin MASKuerade shop owner regarding my skin type (combination) and she sent me products accordingly. She is a doctor so that is definitely getting brownie points and double assurance for buying anything from this shop. They have a great selection of Korean and Japanese skincare brands: Heimish, Miisha, Holika Holika, Etude House, Banilla.co and many more. I was actually looking forward to trying out the Etude House "I Need You" sheet masks and was sent two from that range, Pomegranate and Collagen. 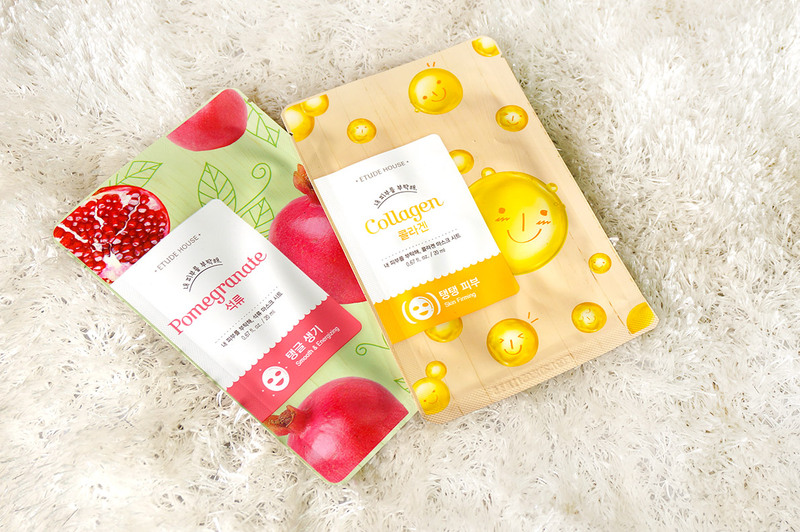 Pomegranate is for smoothing and energizing whereas Collagen sheet mask is for firming. The packaging is super cute but I heard that they have discontinued this design and coming up with a new one, don't know why. 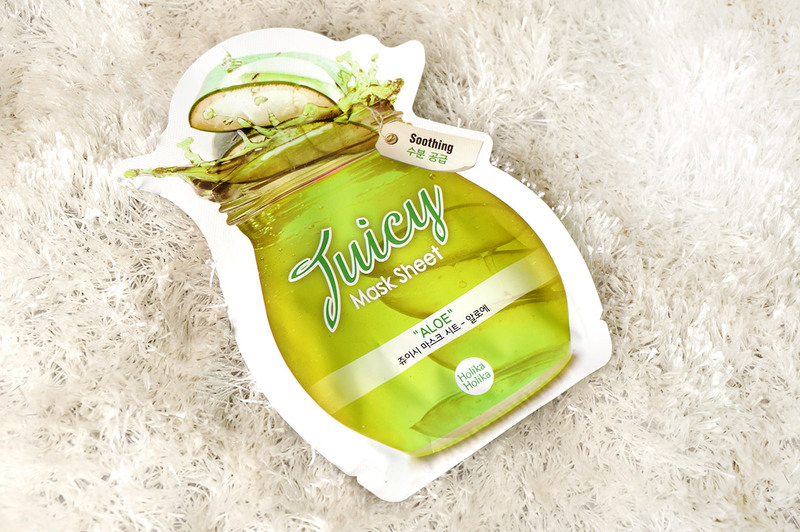 The solution of the mask is very light and absorbed easily, that is something I really like in good sheet masks as some tend to be too moist and overwhelming. I used the Pomegranate sheet mask in the middle of the day. I had returned from a long meeting and it was very hot so I washed my face and used this mask. It was definitely refreshing and my skin felt hydrated and soft for the rest of the day. The Collagen mask also provided hydration and moisture but I didn't experience any firming. What else would you except from one use I suppose. 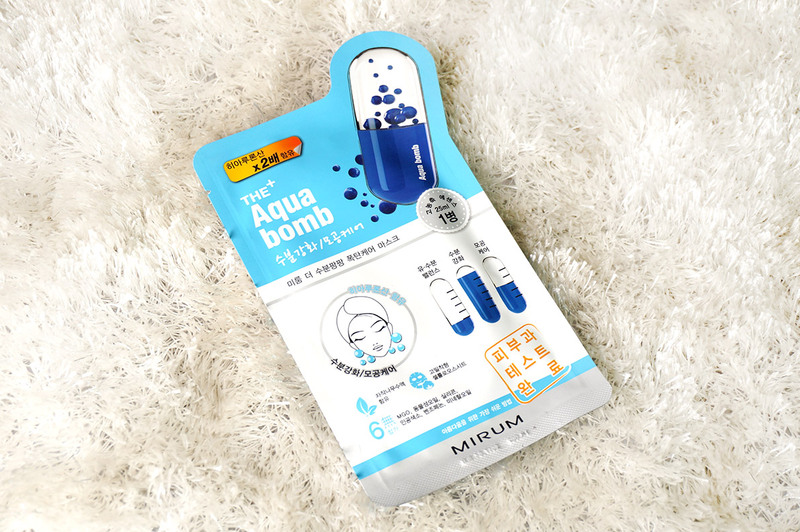 Beauty Water is an aqua based toner but I cant say too much about this product as its a very small quantity to even come up with a verdict. However, I have only read great reviews so I am sure I will order this if I ever want to switch to anything other than my Pixi Glow Tonic. 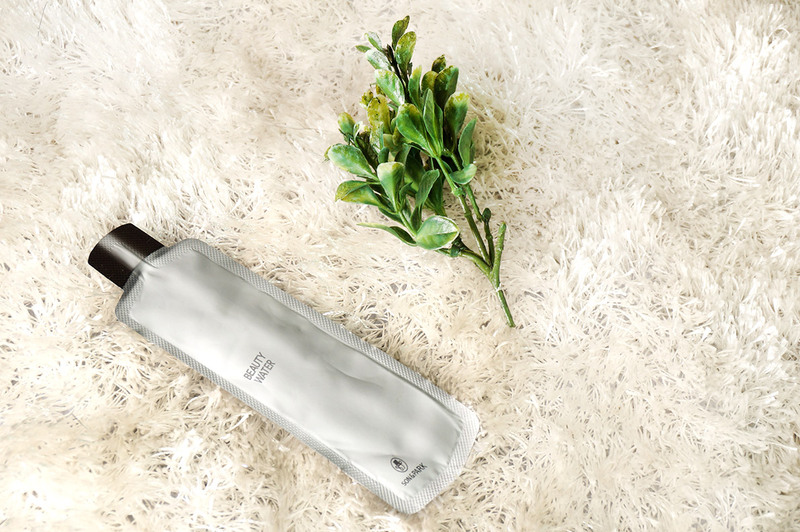 This toner can be used after washing and before your moisturizing steps. It is developed by two of Korea's top makeup artists Son & Park. This is a water based hydrating toner which also has exfoliating properties so it leaves your skin clean, smooth and glowing. The main ingredients are rose water, papaya and willow bark extract which lead to cleansed, plump skin that retains moisture. This is a Multi-tasking water. Use it to hydrate your skin, clean makeup, tone or for gentle exfoliation, wondrous thing for sure. Heimish All Clean Balm was love at first use. I was planning to get Zero it from Banilla.Co but I am glad I discovered this first and going to order the full size now. 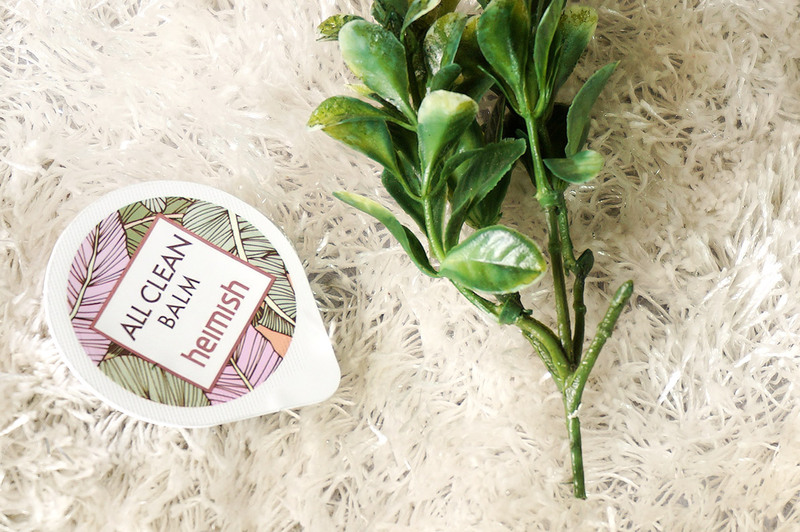 This oil based balm is silky smooth when you apply it on your dry face. 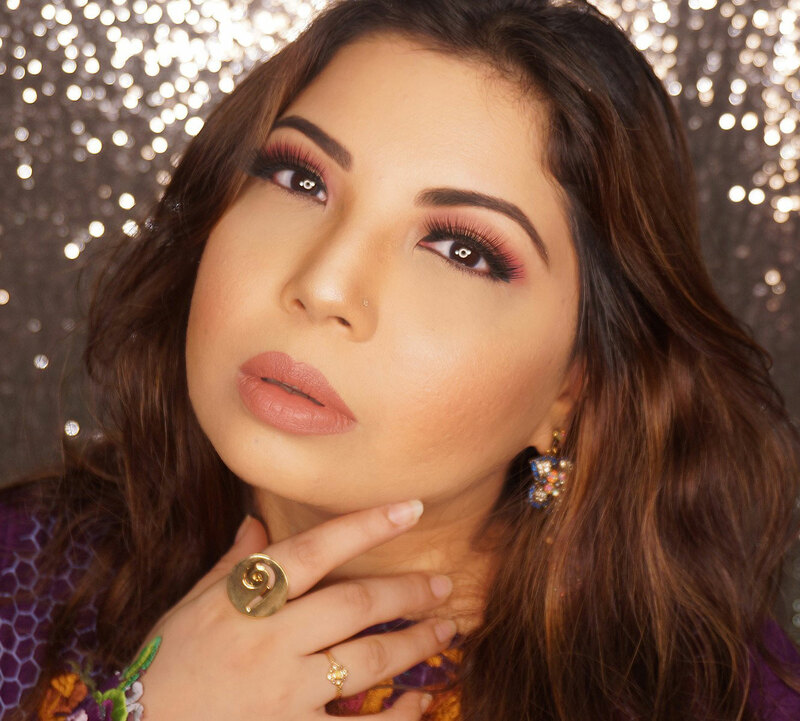 Massage a little all over your face, you can use it with your makeup on too. It cleanses as well as dissolves the dirt and makeup. When you apply water it turns into a milky solution which is easy to wash. You can wash it off and follow up with a foaming face wash for double cleansing, like I do, or you can leave as it is too, works both ways. It contains natural ingredients, is paraben-free, and hypoallergenic making it perfect for all skin types. SO juicy was a very cooling experience. I applied this mask after a seriously long day out in the sun and felt my skin was a bit parched. I also placed it in the refrigerator for a bit and that added that extra kick to the hydrating and cooling effect. The mask is packed with vitamins and moisture which fixes dehydrated, sun burnt skin while infusing moisture. Great for getting a cool skin boost in hot summers. This Aqua bomb was literally a bomb, a bad one, because I was overwhelmed. If there would be such a thing as too much moisture and hydration, this mask is it. It was too wet, my skin felt like it was drowning. Might be ideal foo extreme dry skin but not for me. It also smelled weird and I was already uncomfortable with the heavy solution. Not my cup of tea. These sheet masks should be used for 15 to 20 minutes. After taking them off DON'T wash your face. Pat lightly all over your skin for the ampoule to penetrate. You can buy all these items from The SKin MASKuerade. I got mainly samples to test and the shop sells full size so not completely aware of actual prices but they are quite reasonable as well as worth the investment. you can buy all of the products HERE. *DISCLAIMER: Samples are provided by the Brand/PR company. Reviews are always honest and never paid for unless specified as Sponsored. Will try more soon inshaAllah, probably some from this post. I am obsessed with Korean skincare. I have also ordered through this page. The have great Instock items. I had fun reading the post. 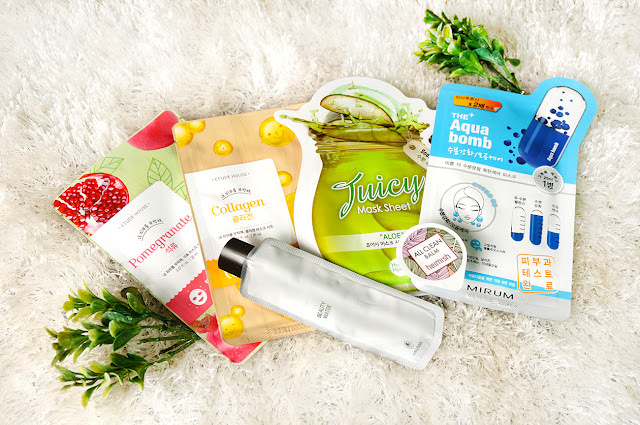 I love using sheet masks and cleansers from Korean brands, they are amazing.